The Islamic Republic of Afghanistan does not recognize any Afghan citizen as being Christian, nor are Afghan citizens legally permitted to convert to Christianity. Although there are no explicit laws that forbid evangelizing by non-Muslims, many authorities and most of society view its toleration as contrary to the practice of Islam. There is only one legally recognized Christian church building in Afghanistan, the Catholic chapel at the Italian Embassy, which is not open to Afghan nationals. Muslims who change their faith to Christianity, are subject to societal and official pressure, which may lead to death, imprisonment or confiscation of property. There are also Christian religious facilities at the foreign military bases, such as an Eastern Orthodox church at the Romanian base in Kandahar. Items and articles belonging to religions other than Islam, such as Bibles, crucifixes, statues, carvings, items with religious symbols, and others, are prohibited. Despite the legal restrictions, many sources claim that there is a secret underground church of Afghan Christians living in Afghanistan. The US state department has stated that estimates of the size of this group range from 500–8000 individuals. Estimates to the size of the Afghan Christian community in Afghanistan however are not reliable. Due to the hostile legal environment Afghan Christians practice their faith secretly in private homes. The complete Bible is available online in Dari, and the New Testament is available in Pashto. Printed versions can also be purchased outside of the country. There are a number of Afghan Christians outside the country, including Christian communities in India, the United States, the United Kingdom, Canada, Austria, Finland, and Germany. Rula Ghani, the country's First Lady since 2014, is a Maronite Christian from Lebanon. According to tradition, the Indo-Parthian king Gondophares was proselytized by the Apostle Thomas, who continued on to southern India, and possibly as far as Malaysia or China. According to the Acts of the Apostles (Acts 2:9) in the Bible ethnic Jews and converts to Judaism from the Parthian Empire (which included parts of western Afghanistan) were present at Pentecost. According to Eusebius' record, the apostles Thomas and Bartholomew were assigned to Parthia. Legend based on the apocryphal Gospel of Thomas and other ancient documents suggests that Saint Thomas preached in Bactria, which is today northern Afghanistan. An early third-century Syriac work known as the Acts of Thomas connects the apostle's ministry with two kings, one in the north and the other in the south. According to the Acts, Thomas was at first reluctant to accept this mission, but the Lord appeared to him in a night vision and compelled him to accompany an Indian merchant, Abbanes (or Habban), to his native place in northwest India. There, Thomas found himself in the service of the Indo-Parthian (Southern Afghanistan, Pakistan, and Northern India) King, Gondophares. The Apostle's ministry resulted in many conversions throughout the kingdom, including the king and his brother. Bardaisan, writing in about 196, speaks of Christians throughout Media, Parthia and Bactria and, according to Tertullian (c.160–230), there were already a number of bishoprics within the Persian Empire by 220. By the time of the establishment of the Second Persian Empire (AD 226), there were bishops of the Church of the East in northwest India, Afghanistan and Baluchistan, with laymen and clergy alike engaging in missionary activity. In 409, the Church of the East (also sometimes called the Nestorian Church) received state recognition from King Yazdegerd I (reigned 399–409), of the Iranian Sassanid Empire which ruled what is now Afghanistan from 224–579. In 424, Bishop Afrid of Sakastan, an area which covered southern Afghanistan including Zaranj and Kandahar, attended the Synod of Dadyeshu. This synod was one of the most important councils of the Church of the East and determined that there would be no appeal of their disciplinary or theological problems to any other power, especially not to any church council in the Roman Empire. The year 424 also marks the establishment of a bishop in Herat. In the 6th century, Herat was see of a Metropolitan See the Apostolic Church of the East, and from the 9th century Herat was also the see of the Syriac Orthodox Metropolitan. The significance of the Christian community in Herat can be seen in that till today there is a district outside of the city named Injil, the Arabic/Dari/Pashto word for Gospel. The Christian community was present in Herat until at least 1310. Tekuder, who was a Christian convert to Islam, receives an embassy. 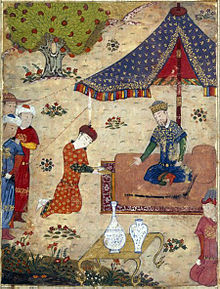 From the Tarikh-i Jahangushay-i Juvaini by Ata-Malik Juvayni. The Apostolic Church of the East established bishops in nine cities in Afghanistan including Herat (424–1310), Farah (544–1057), Zaranj (544), Bushanj (585), Badghis (585) Kandahar, and Balkh. There are also ruins of a Nestorian convent from the 6th–7th centuries a short distance from Panj, Tajikistan on the north bank of the Amu Darya very close to the Afghan border, near Kunduz. The complex was discovered and identified by Soviet archeologists in 1967. It consists of dozens of small rooms carved into a rock formation. Ahmed Tekuder, also known as Sultan Ahmad (reigned 1282–1284) was the sultan of the Ilkhan Empire, a Mongol Empire which stretched from eastern Turkey to Pakistan and covered most of Afghanistan. Tekuder was born Nicholas Tekuder Khan as a Nestorian Christian; however, Tekuder later embraced Islam and changed his name to Ahmed Tekuder. When Tekuder assumed the throne in 1282, he turned the Ilkhan empire into a sultanate. Tekudar zealously propagated his new faith and sternly required his ranking offices to do the same. The Ilkhan Empire ultimately adopted Islam as a state religion in 1295. The Church of the East was almost completely eradicated across Afghanistan and Persia during the reign of Timur (1336–1405). In 1581 and 1582 respectively, the Jesuit and Spanish Montesserat and the Portuguese Bento de Góis were warmly welcomed by the Islamic Emperor Akbar, but there was no lasting presence by the Jesuits in the country. There were Armenian merchants living in Kabul as early as 1667 who were in contact with the Jesuits in Mughal (modern day India). It is unclear if these Armenian merchants were Christians but their presence suggests an Armenian community in Kabul in the 17th century. Kabul was under the ecclesiastical jurisdiction of the Armenian Apostolic Church Perso-Indian diocese in New Julfa, Esfahan (modern day Iran), which sent Armenian priests to the community; however, no Armenian priest came after 1830. In 1755, Jesuit missionary to Lahore Joseph Tiefenthaler reported that Sultan Ahmad Shah Bahadur took several Armenian gun makers from Lahore to Kabul. Anglican missionary Joseph Wolff preached to their descendants in Kabul in Persian in 1832; by his account, the community numbered about 23 people. In 1839, when Lord Keane marched to Kabul, the Chaplain, the Rev. G. Pigott, baptised two of the children at the Armenian church. And in 1842, the Rev. J. N. Allen, Chaplain to General William Nott's force, baptized three others. The only reported baptism of an ethnic Afghan in the Armenian Church was said to be a robber who broke into the church through the roof and fell three times while attempting to leave with the valuable silver vessels stored there. When he was discovered, he begged for mercy and later asked to be baptized. The Armenian church building near Bala Hissar was destroyed during the Second Anglo-Afghan War by British troops; the community received compensation from the British Foreign and Commonwealth Office for their loss, but the church was never rebuilt. As late as 1870, British reports showed 18 Armenian Christians remaining in Kabul. In 1896, Abdur Rahman Khan, Emir of Afghanistan, even sent a letter to the Armenian community at Calcutta, India (now Kolkata), asking that they send ten or twelve families to Kabul to "relieve the loneliness" of their fellow Armenians, whose numbers had continued to dwindle. However, despite an initial reply of interest, in the end, none of the Armenians of Calcutta accepted the offer. The following year, the final remnants of the Armenians were expelled after a letter from Ottoman Sultan Abdul Hamid II to the Afghan ruler questioning the loyalty of the Armenians. The Armenians of Kabul took refuge in Peshawar. It is worth mentioning that these refugees carried with them their religious books and ancient manuscripts. An article on this issue in the Englishman (Calcutta) dated 11 February 1907 stated: “These people in the time of the late Ameer Abdul Rahman had dwindled down to ten families. They were, for reasons unknown, banished to Peshawar and brought down with them a collection of manuscripts said to be of immense antiquity. Indeed, they are so old that none of the families possessing them are able to read them… In any case an examination by experts of the manuscripts now said to be in Peshawar, should yield some valuable results. The families themselves are unaware of the history of the first settlement in Kabul, except that it dates back to the very earliest times.”  Armenian Archbishop Sahak Ayvadian, after this publication went to Peshawar for a pastoral visit to these Armenians as well as to examine the books and manuscripts. On his return to Calcutta he presented some books to the Armenian Church Library, which he had obtained from the refugees. The only legally recognized church in Afghanistan today is in the Italian embassy. Italy was the first country to recognize Afghanistan’s independence in 1919, and the Afghan government asked how it could thank Italy. Rome requested the right to build a Catholic chapel, which was being requested by international technicians then living in the Afghan capital. A clause giving Italy the right to build a chapel within its embassy was included in the Italian-Afghan treaty of 1921, and that same year the Barnabites arrived to start giving pastoral care. The actual pastoral work began in 1933 when the chapel international technicians had asked for was built. In the 1950s, the simple cement chapel was finished. From 1990 to 1994, Father Giuseppe Moretti served as the only Roman Catholic priest in Afghanistan, but he was forced to leave in 1994 after being hit with shrapnel and had to return to Italy. After 1994, Little Sisters of Jesus were the only Catholic religious workers allowed to remain in Afghanistan, as they had been there since 1955 and their work was renowned. 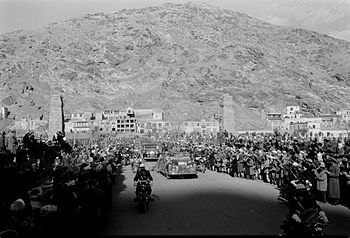 In 1959, US President Dwight D. Eisenhower visited Afghanistan. The Islamic Center of Washington had recently been built in Washington, DC for the Muslim diplomats there and President Eisenhower requested permission from King Zahir Shah to construct a Protestant church in Kabul on a reciprocal basis for the use of the diplomatic corp and expatriate community in Afghanistan. Christians from all around the world contributed to its construction. At its dedication, the cornerstone which was carved in Afghan alabaster marble read: "To the glory of God 'Who loves us and has freed us from our sins by His blood' this building is dedicated as 'a house of prayer for all nations' in the reign of H.M. Zahir Shah, May 17, 1970 A.D., 'Jesus Christ Himself being the Chief Cornerstone'." The Church building however was destroyed 17 June 1973. On that same day Mohammed Daoud Khan seized power from his cousin (and brother-in-law) Zahir Shah and declared himself president of the newly created Republic of Afghanistan. Since the destruction of the church building, no place of worship has been authorized for Protestant Christians. The number of converts to Christianity increased as the U.S. presence increased after the fall of the Taliban in 2001. Most of the Christian converts lived in urban areas, so the threat from the Taliban was minimal. But many Christian converts started fleeing Afghanistan (mostly to India) around 2005, fearing their identities might become public. A 2015 study estimated some 3,300 believers in Christ from a Muslim background living in the country. 5 August 2001, 24 workers for the NGO Shelter Now International were arrested. The charity built homes for refugees and the poor. 16 were Afghans and 8 were westerners. The workers were eventually freed after a rescue mission in November 2001. The westerners had been six women and two men, from Germany, America and Australia. The staff of Shelter Now had been accused of converting Afghan Muslims to Christianity. In 2003, Mullah Dadullah (Pashto: ملا دادالله آخوند‎), a top Taliban commander, said that they would continue to fight until the "Jews and Christians, all foreign crusaders" were expelled from Afghanistan. In January 2004, Afghanistan adopted a new constitution that provides for the freedom of non-Muslim religious groups to exercise their faith and declares that the state will abide by the UN Charter, international treaties, international conventions and the Universal Declaration of Human Rights. However, the constitution does not extend explicit protections for the right to freedom of religion or belief to every individual, particularly to individual Muslims, the overwhelming majority of Afghanistan‘s population, or minority religious communities. In 2005 President Hamid Karzai showed his respects by attending the funeral of Pope John Paul II. In February 2006, an Afghan Christian, Abdul Rahman (Persian: عبدالرحمن‎) (born 1965) was arrested in February 2006 and threatened with the death penalty for converting to Christianity. On 26 March 2006, under heavy pressure from foreign governments, the court returned his case to prosecutors, citing "investigative gaps" and suspicions that he was 'mentally unbalanced'. He was released from prison to his family on the night of 27 March. On 29 March, Abdul Rahman arrived in Italy after the Italian government offered him asylum. On 19 July 2007, 23 South Korean missionaries were captured and held hostage by members of the Taliban while passing through Ghazni Province. Two male hostages were executed before the deal was reached between the Taliban and the South Korean government. The group, composed of sixteen women and seven men, was captured while traveling from Kandahar to Kabul by bus on a mission sponsored by the Saemmul Presbyterian Church. Of the 23 hostages captured, two men, Bae Hyeong-gyu, a 42-year-old South Korean pastor of Saemmul Church, and Shim Seong-min, a 29-year-old South Korean man, were executed on 25 and 30 July, respectively. Later, with negotiations making progress, two women, Kim Gyeong-ja and Kim Ji-na, were released on 13 August and the remaining 19 hostages on 29 and 30 August. In September 2008, the Afghan parliament passed a new media law which prohibits works and materials that are contrary to the principles of Islam, works and materials offensive to other religions and sects, and propagation of religions other than Islam. In October 2008 Gayle Williams (1974? – 20 October 2008), an aid worker for SERVE Afghanistan of joint British and South African nationality, was shot on her way to work in Kabul by two men on a motorbike. Zabiullah Mujahid, a spokesman for the Taliban, claimed responsibility for her death and said she had been killed "because she was working for an organization which was preaching Christianity in Afghanistan". In May 2009, it was made public that Christian groups had published Bibles in the Pashtun language and the Dari language, intended to convert Afghans from Islam to Christianity. The Bibles were sent to soldiers at the Bagram Air Base. American military authorities report that Bible distribution was not official policy, and when a chaplain became aware of the soldiers' plans the Bibles were confiscated and, eventually, burned. In March 2010 the remaining buildings on the leased property where the 1970 built Protestant church had stood were destroyed. The buildings had been unofficially used by the international Christian community as a meeting place. The 99-year lease of the property which was paid for in gold in 1970 was not honored by the Afghan courts. In June 2010 Noorin TV, a small Afghan television station, showed footage of men it said were reciting Christian prayers in Dari and being baptized. The television station said the men were Afghans who had converted to Christianity. Two humanitarian agencies, Norwegian Church Aid and Church World Service of the United States, were suspended after it was suggested in this report that they had converted Afghan Muslims to Christianity. Later Noorin TV confirmed that there was no evidence against the two agencies and that they had been named because of the word “church” in their names. The report sparked anti-Christian protests in Kabul and in Mazar-e Sharif. In parliament, Abdul Sattar Khawasi, a deputy of the lower house, called for Muslim converts to Christianity to be executed and Qazi Nazir Ahmad, a lawmaker from the western province of He-rat, said killing a converted Muslim was “not a crime”. One of the men shown in the video, among the 25 Christians arrested was Said Musa (also spelled Sayed Mussa), an Afghan Red Cross worker, who was later sentenced to death for converting to Christianity. On 5 August 2010, ten members of the International Assistance Mission Nuristan Eye Camp team were killed in Kuran wa Munjan District of Badakhshan Province in Afghanistan. The team was attacked as it was returning from Nuristan to Kabul. One team member was spared, the rest of the team were killed immediately. Those killed were six Americans, two Afghans, one Briton and one German. Both Hizb-e Islami and the Taliban initially claimed responsibility for the attack, accusing the doctors of proselytism and spying. These claims were later refuted by Taliban leaders in Nuristan and Badakhshan, who stated that they had confirmed the dead were bona-fide aid workers, condemned the killings as murder, and offered their condolences to the families of those killed. The attack was the deadliest strike against foreign aid workers in the Afghanistan war. The killings underscored the suspicion Christian-affiliated groups face from some Afghans and government opponents and the wider risks faced by aid workers in the country. On 9 August 2010, two Afghan and two aid workers were arrested for preaching Christianity in western Herat province. Two NGO workers were deported from the country and Afghan were kept for longer period. After a long negotiation government free them in Kabul. In November 2010, Another man, Shoaib Assadullah Musawi, was jailed in the northern city of Mazar-i-Sharif after being accused of giving the New Testament to a friend, who then turned him in. Shoaib Assadullah was freed from prison on 30 March 2011 and on 14 April 2011 received a passport and left Afghanistan. In February 2011, International Christian Concern lauded the release of Said Musa (also spelled Sayed Mussa) an Afghan man who had been imprisoned for nine months for converting to Christianity. ^ "Antiochian Chaplain Ministers in Afghanistan". Antiochian.org. Retrieved 3 June 2014. ^ "Letter From Fr. David Alexander to St. Anthony's Parish". Antiochian.org. Retrieved 3 June 2014. ^ "Christians in Afghanistan: A Community of Faith and Fear". Spiegel.de. 30 March 2006. Retrieved 10 March 2017. ^ "Afghan Bibles". Afghan Bibles. Retrieved 1 April 2011. ^ "Pashto Bible online – Index". Pashtozeray.org. Retrieved 1 April 2011. ^ Faroquee, Neyaz (22 July 2013). "An Afghan Church Grows in Delhi". The New York Times. Retrieved 16 July 2014. In a South Delhi neighborhood, the sound of a man reciting Dari, a Farsi dialect spoken in Afghanistan, over a loudspeaker attached to a modest two-story building rose over the din of vegetable hawkers. The building was a church run by Afghan refugees who had converted to Christianity. The man was a young Afghan priest reading the Bible before a Sunday service in its basement. Between 200 and 250 Afghan converts from Islam to Christianity who feared persecution from the Afghan authorities and the Taliban have found refuge in Delhi. ^ "Afghan Christian Fellowship, Los Angeles". Afghanchurch.net. Retrieved 1 April 2011. ^ Mohammadi, Reza (6 March 2009). "Plight of an Afghan Christian". The Guardian. London. ^ "Iranian Christian Churches in Canada, Iranian Christian Church in Toronto Canada, Iranian Christian Church in Montreal Canada, Iranian Christian Church in Vancouver Canada, Persian Church in Canada, Farsi Church in Canada, farsi Church in Toronto, farsi Church in vancouver, Worldwide Directory of Iranian/Persian Christian Churches – Iranian Christian Churches in Toronto, Vancouver, Montreal". Farsinet.com. Retrieved 1 April 2011. ^ "کليسايی تعميدی افغان" [ABC About us]. Khudawand.com. Archived from the original on 13 July 2011. Retrieved 1 April 2011. ^ Hundreds of asylum seekers in Finland converting from Islam to Christianity. Retrieved August 13, 2017. ^ Muslims Converting to Christianity by the Hundreds in Finland. Retrieved August 13, 2017. ^ Christian refugee converts in Germany face violent attacks. Retrieved August 13, 2017. ^ "Map of Parthian Empire, 1st century BCE". Encyclopaedia Britannica, Inc. Retrieved 22 January 2018. ^ "Afghanistan, Historical beginnings (to the 7th century CE)". Retrieved 22 January 2018. ^ "Legendary horsemen and battlefield tacticians, willing to travel vast distances and strike at a moment's notice, the Parthians took advantage of the collapsing Seleucid Empire to carve out an empire during the late 3rd century BC to the 1st century AD that, at its peak, covered a vast region — from the Caspian Sea in the north to Syria in the west, the Persian Gulf in the south and the western half of present-day Afghanistan to the east —making it second only to the Roman Empire in size and economic might." CENTCOM Heritage/Cultural Advisory Group Training Module. "Parthian, Indo-Greek, Indo-Parthian, Yuezhi Invasion and Indo-Scythian Rule (circa 200 BC to circa 100 AD)". Colorado State University. Retrieved 22 January 2018. ^ Merillat, Herbert Christian (1997). "Wandering in the East". The Gnostic Apostle Thomas. Archived from the original on 27 September 2004. Retrieved 11 August 2009. ^ "We are Christians by the one name of the Messiah. As regards our customs our brethren abstain from everything that is contrary to their profession.... Parthian Christians do not take two wives.... Our Bactrian sisters do not practice promiscuity with strangers. Persians do not take their daughters to wife. Medes do not desert their dying relations or bury them alive. Christians in Edessa do not kill their wives or sisters who commit fornication but keep them apart and commit them to the judgment of God. Christians in Hatra do not stone thieves" (quoted in Mark Dickens: The Church of the East). ^ Willison, Walker (1985). A history of the Christian church. Simon & Schuster. p. 91. ISBN 978-0-684-18417-3. ^ Sanasarian, Eliz (Summer–Fall 1998). "Babi-Bahais, Christians, and Jews in Iran". Journal of the Assyrian Academic Society. 31 (3–4). JSTOR 4311193. ^ "Christianity in Iran, a Brief History". Culture of IRAN. Retrieved 1 April 2011. ^ a b c "Location of Nestorian Bishops". Nestorian.org. Archived from the original on 15 May 2011. Retrieved 1 April 2011. ^ a b "Chronology of Catholic Dioceses: Afghanistan" (in Norwegian). Katolsk.no. 15 May 2008. Retrieved 1 April 2011. ^ a b c "Asia at a Glance". Archived from the original on 18 August 2000. Retrieved 3 June 2014. ^ Maria Adelaide. "Nestorianism in Central Asia during the First Millennium: Archaeological Evidence" (PDF). Journal of the Assyrian Academic Society: 17/34. Retrieved 6 March 2010. ^ "Jesuits in Afghanistan?". SJ Electronic Information Service. 17 June 2005. Archived from the original on 14 May 2006. Retrieved 18 June 2006. ^ "After 400 years, Jesuits return to Afghanistan". Australian Jesuits. Archived from the original on 29 September 2007. Retrieved 11 August 2009. ^ a b "Armenians in Kabul". Angelfire.com. Retrieved 1 April 2011. ^ "Asia/Afghanistan – Barnabite Fathers 70 Years of Service in Afghanistan: Kabul Mission First Step for Growth of Local Church" Says Nuncio to Pakistan, Archbishop Alessandro D'Errico". Fides. 29 September 2003. Archived from the original on 11 June 2005. Retrieved 18 June 2006. ^ "A "public" church in Afghanistan? The past offers hope for the present (Overview)". Asianews.it. 12 October 2005. Retrieved 18 June 2006. ^ "Mass Celebrated Again in Afghan Capital". zenit.org. 27 January 2002. Archived from the original on 6 March 2002. Retrieved 11 August 2009. ^ "The Sisters of Mother Teresa arrive in Kabul". Asianews.it. 2 November 2004. Archived from the original on 12 January 2008. Retrieved 18 June 2006. ^ "Afghanistan May Now Be a Priestless Nation". zenit.org. 8 November 2001. Archived from the original on 3 December 2001. Retrieved 11 August 2009. ^ "Catholic presence expanding, Jesuit NGO and Sisters of Mother Teresa to arrive". Asianews.it. 23 May 2005. Archived from the original on 26 May 2005. Retrieved 18 June 2006. ^ "The Untold Story of Afghanistan". IAM. 26 July 2007. Archived from the original on 24 July 2011. Retrieved 1 April 2011. ^ a b Floyd McClung (1 September 1996). Living on the Devil's Doorstep: From Kabul to Amsterdam. YWAM Publishing. pp. 67–. ISBN 978-0-927545-45-7. Retrieved 1 April 2011. ^ An Afghan Church Grows in Delhi. 22 July 2013. Retrieved 4 February 2015. ^ "Extraordinary Missions present at the Solemn Funeral of Pope John Paul II". Vatican.va. Archived from the original on 19 February 2008. Retrieved 1 April 2011. ^ "Afghan Christian Convert Finds Sanctuary". MSNBC. Associated Press. 29 March 2006. Retrieved 27 August 2010. ^ Constable, Pamela (23 March 2006). "For Afghans, Allies, A Clash Of Values". The Washington Post. Retrieved 30 April 2010. ^ Munadi, Sultan M. (26 March 2006). "Afghan Case Against Christian Convert Falters". The New York Times. ^ "Monday, March 27". CNN. 28 March 2006. ^ Vinci, Alessio (29 March 2006). "Afghan convert arrives in Italy for asylum". CNN. ^ "Korean Missionaries under Fire". Time Magazine. 27 July 2007. Retrieved 8 September 2007. ^ Shah, Amir (29 April 2007). "Taliban to free 19 S. Korean hostages". Associated Press. Archived from the original on 9 September 2007. Retrieved 29 August 2007. ^ "US burns Bibles in Afghanistan row". Al Jazeera. 22 May 2009. Archived from the original on 26 May 2009. ^ "Military burns unsolicited Bibles sent to Afghanistan". CNN. 22 May 2009. Retrieved 26 May 2009. 'This was irresponsible and dangerous journalism sensationalizing year-old footage of a religious service for U.S. soldiers on a U.S. base and inferring that troops are evangelizing to Afghans,' Col. Gregory Julian said. ^ "U.S. Military Accused of Handing Out Bibles in Afghanistan". Fox News. 4 May 2009. Archived from the original on 9 May 2009. Retrieved 25 May 2009. ^ Matiullah Mati (21 November 2010). "Afghan Christian faces trial for alleged conversion from Islam". CNN. Retrieved 26 May 2012. ^ Gannon, Kathy (8 August 2010). "British aid worker killed in massacre in Afghanistan". The Herald. Retrieved 8 August 2010. ^ a b Nordland, Rod (7 August 2010). "10 Medical Aid Workers Are Found Slain in Afghanistan". The New York Times. Retrieved 7 August 2010. ^ Gannon, Kathy (7 August 2010). "Afghan medical mission ends in death for 10". Associated Press. Retrieved 7 August 2010. ^ "Killing of British doctor in Afghanistan 'a cowardly act' says William Hague". The Daily Telegraph. London. 8 August 2010. ^ "Foreign medical workers among 10 killed in Afghanistan". BBC News. 7 August 2010. ^ "Eight foreign medical workers killed in Afghanistan". Reuters. 7 August 2010. ^ Motlagh, Jason (9 August 2010). "Will Aid Workers' Killings End Civilian Surge?". TIME. Retrieved 10 August 2010. ^ Partlow, Joshua (8 August 2010). "Taliban kills 10 medical aid workers in northern Afghanistan". The Washington Post. Retrieved 8 August 2010. ^ King, Laura (7 August 2010). "6 Americans among 10 charity workers killed in Taliban ambush". Los Angeles Times. Retrieved 7 August 2010. ^ Jonsson, Patrik (7 August 2010). "International Assistance Mission slayings: part of Taliban war strategy". The Christian Science Monitor. Retrieved 7 August 2010. ^ "Afghanistan war: Deadly ambush of medical mission roils one of safest provinces". Csmonitor.com. 7 August 2010. Retrieved 1 April 2011. ^ "Afghanistan aid workers' deaths highlights delicate position of Christian-affiliated groups". Csmonitor.com. 9 August 2010. Retrieved 1 April 2011. ^ Ray Rivera (5 February 2011). "Afghan Rights Fall Short for Christian Converts". The New York Times. Retrieved 25 May 2012. ^ "Afghan Christian Released from Prison and Safely out of the Country". Persecution.org. 20 April 2011. Retrieved 26 May 2012. ^ Adam Schreck; Heidi Vogt (25 February 2011). "Afghan Case Against Christian Convert Falters". Washington Post. Retrieved 25 May 2012. This page was last edited on 29 December 2018, at 22:20 (UTC).